Summer Package Includes Bikes, Kayak Excursion and Beach Bags! We cannot say enough about this incredible vacation home! 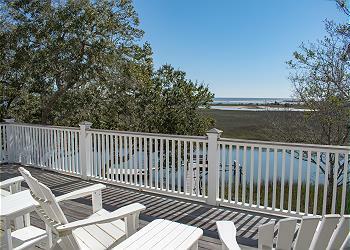 From the moment you enter the home your eyes are drawn to the gorgeous marsh and creek views. As the tides change and the sun rises and sets you will continually be captivated by the magic of Seabrook Island. The private dock is deep water all the time. Bring your kayaks and fishing poles! Captain Sam's Creek is teeming with life! Dolphins, crabs, redfish, and flounder are abundant. The shorebirds grace the marshy grasses so bring your binoculars too! The chef's kitchen is a dream for any Top Chef in the family! Guests may relax in over 4000 square feet of living space. Every guest bedroom suite is expansive and offers a luxurious, full bath. The elevator runs from the garage to the top floor and offers great convenience. If you love luxury accommodations, exceptional waterfront living and freebies this home on the water this will be your Seabrook Island vacation yet!